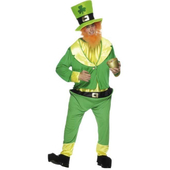 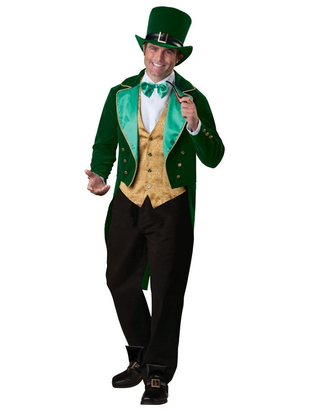 Deluxe Lucky Leprechaun costume includes dark green velour tails coat with satin and gold trim details. 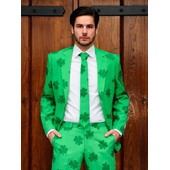 Also included in this holiday look is brocade waistcoat with shamrock buttons and an attached white shirt front and a green dickie with bow tie. 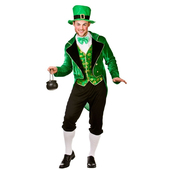 To complete the Leprechaun costume a green velour hat and shoe covers with buckles are also included. 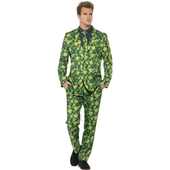 Please note trousers, shoes and pipe are not included.